As a mom, a lot of people depend on us. And this couldn't be more true for Alison, a firefighter and mom of 5-year old Gwen, who I recently had the pleasure of working with to totally overhaul her laundry room. At work, people depend on Alison to help save lives, and at home, her family depends on her for countless things – so creating systems and spaces that allow her to reliably get the job done was the name of the game in this space. What I love about these units is the Extra Power feature. 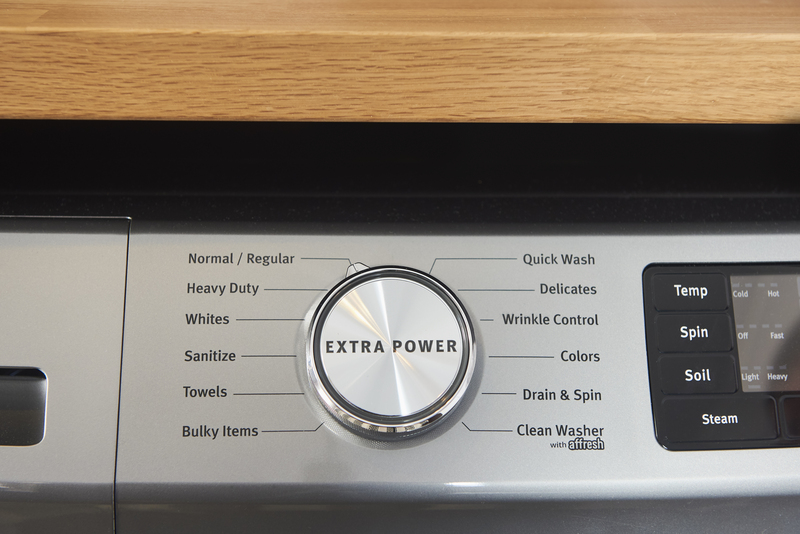 The Extra Power button fights stains that dissolve best in hot water and in cold – all in one load. The washer offers the Most Powerful Cleaning in the industry driven by the Heavy Duty cycle. 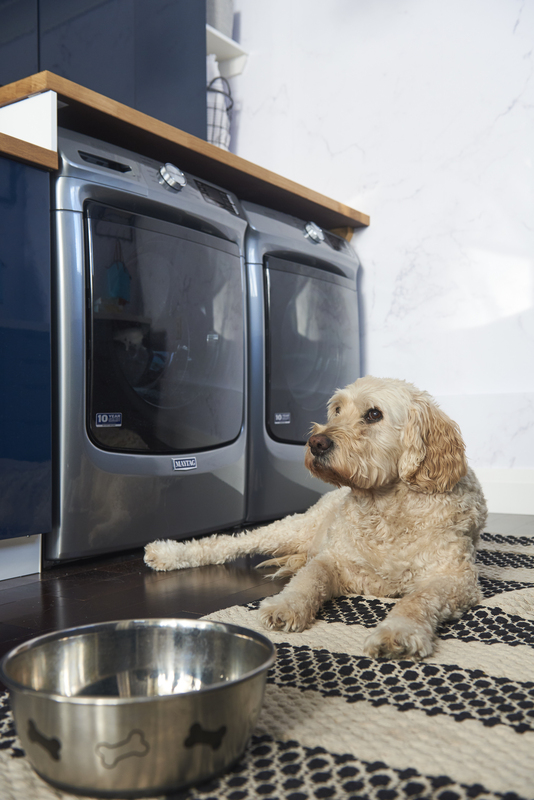 The 16-Hr Fresh Hold® option keeps your clean clothes smelling fresh in the washer for up to 16 hours after the wash cycle ends thanks to its internal fan and intermittent tumbling that circulate air through the clothes. 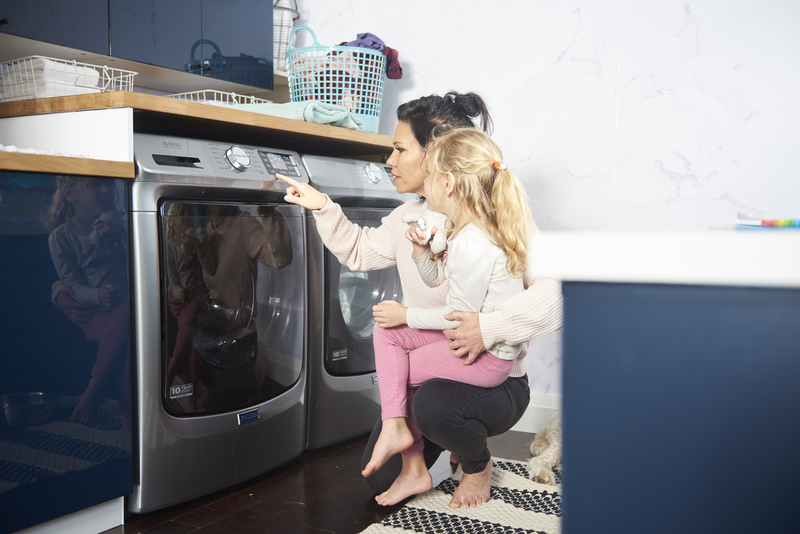 The Extra Power button helps get thick fabrics drier the first time by adding extra time to the cycle. There are options for steam-enhanced cycles to help prevent wrinkles, refresh clothes and reduce static. The Advanced Moisture Sensing feature monitors inside moisture and air temperatures to help evenly and fully dry heavy loads. 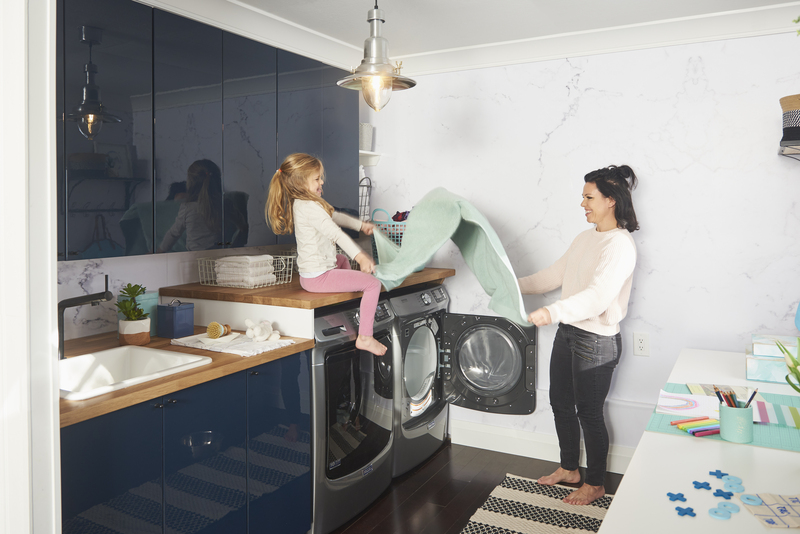 You can dry a small load fast with the Quick Dry cycle, which pairs nicely with the Quick Wash cycle on select Maytag® washers to get clothes ready in no time. That's the kind of cleaning we all need at home. 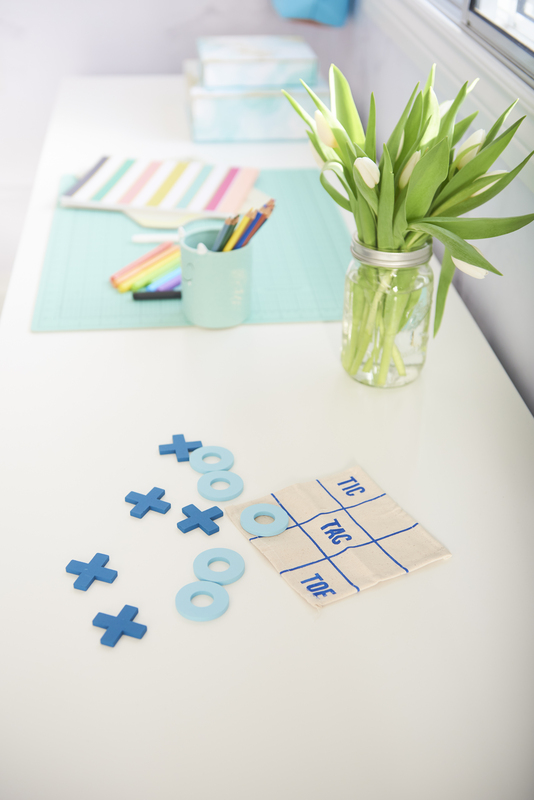 Alison's home is teeny-tiny, so every single square inch of this space needed to count. I went with taller than normal uppers in a high gloss navy blue for a look that is both modern and functional, allowing Alison to store detergent, cleaning supplies, towels and other necessities in arms reach. We also incorporated storage on the other side of the room with multiple drawers, and decorative shelving. 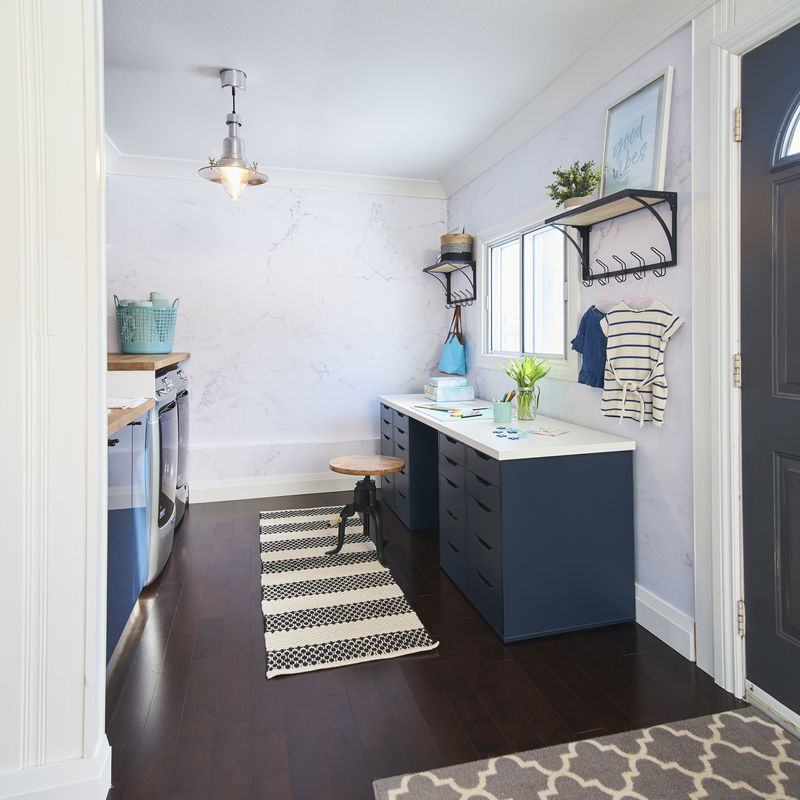 This space doubles as a desk for Alison's young daughter when not needed for folding! Whether you are a Netflix-and-fold kind of person or not, I think a dependable laundry space needs to have ample counter space. 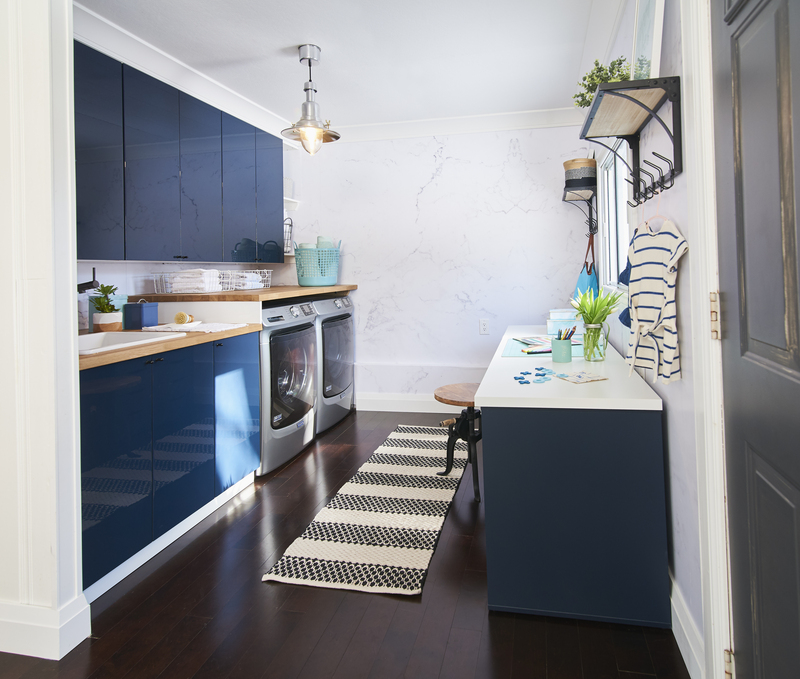 In this space, I used butcher block counters to provide a warm textural contrast against the blue cabinetry and marble wallpapered walls. 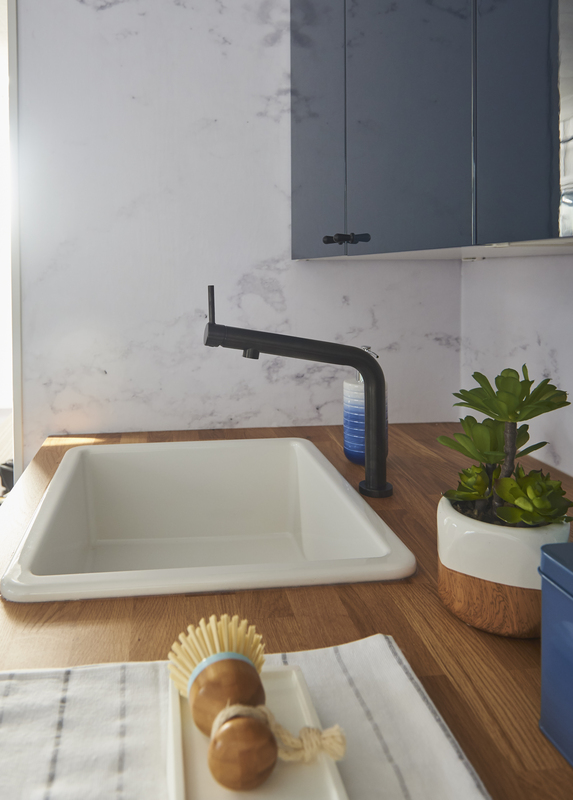 Installing a counter over a front-load washer and dryer is always a design-must for me as it provides a durable surface and creates a more built-in look to your appliances. 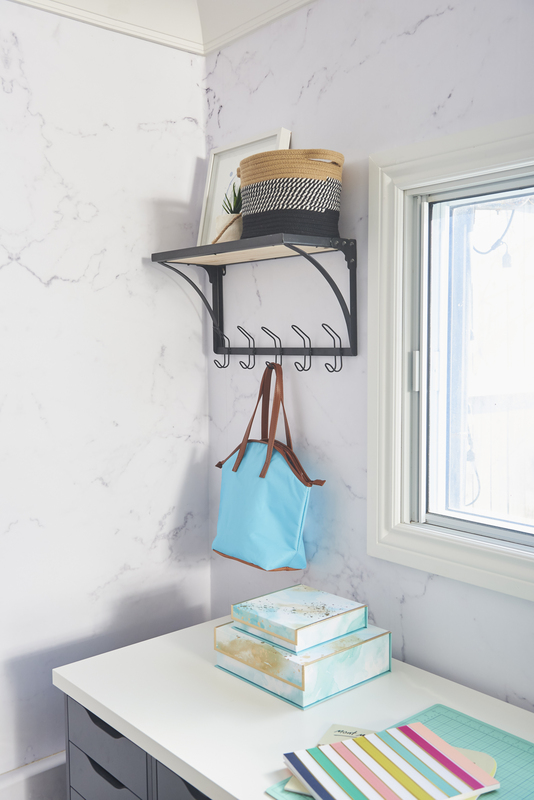 I think one of the most overlooked functions of a laundry room is space for hanging clothing that needs to air dry. 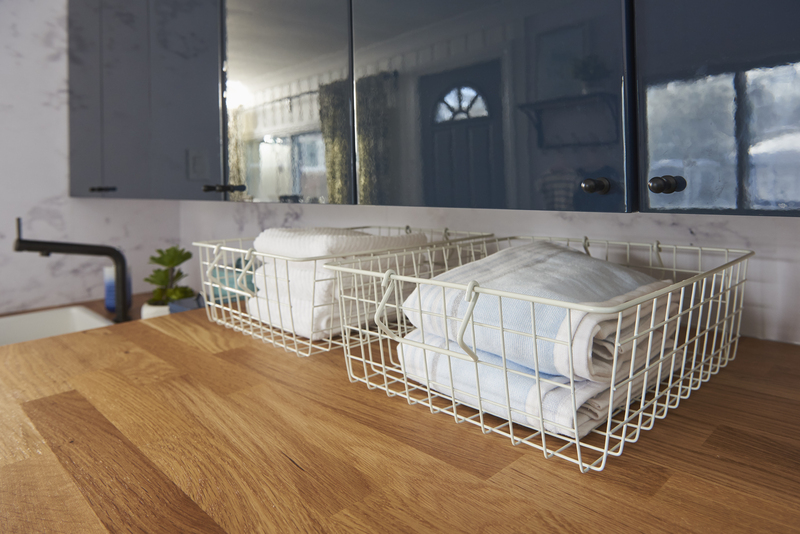 Whether you use a folding wire contraption that allows clothing to lay flat, a rope that allows you to hang clothing, or hooks like I did right here, you definitely need to plan for this element so the behaviour of air drying clothing actually happens! 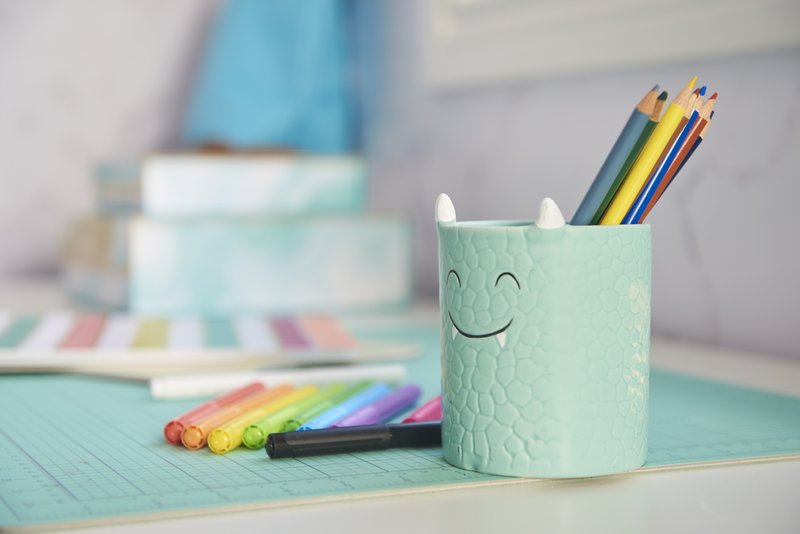 I am a big believer that when a space is beautiful, we are so happy to be there, and this makes us super productive. So we utilized all KINDS of strategies to make this space just gorgeous. We wrapped a marble wallpaper along all the walls, we added gorgeous crown moulding, we added all kinds of teal accents and just had so much fun with art, beautiful towels, and greenery. Thanks to Maytag for partnering with me on this project! 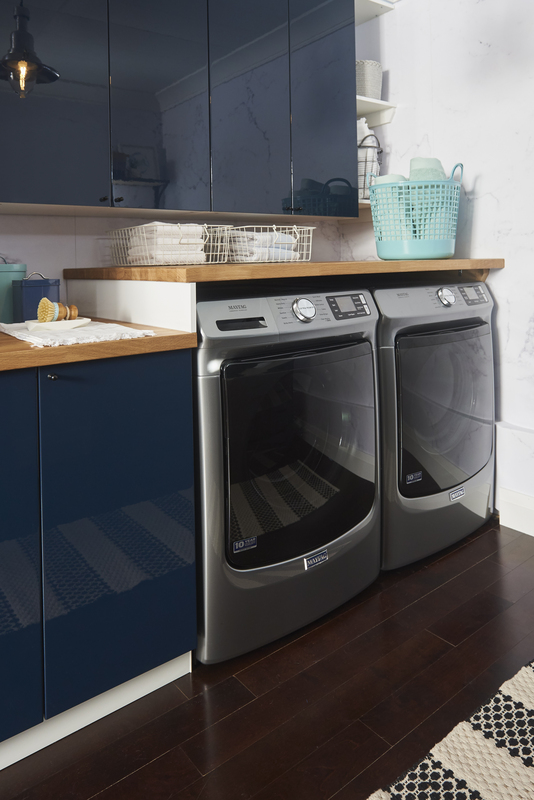 For more info on how to use their appliances to create a dependable laundry room, click here. This post is a sponsored post by Maytag. I work hard to research and stand behind the brands I partner with as I want to provide content that will help make your life easier, and more beautiful as a hardworking mom.